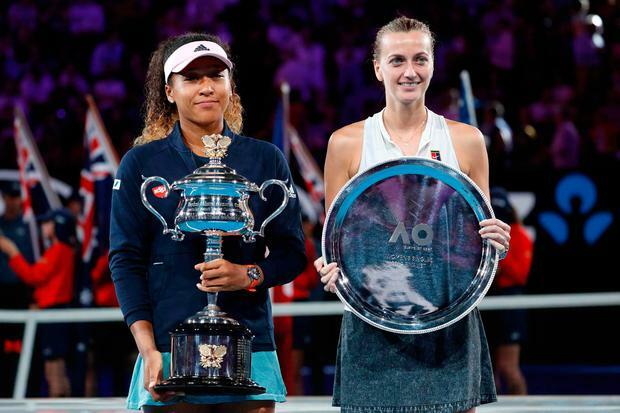 Osaka and Kvitova are two of the biggest hitters on the women's tour and long rallies were scarce as both looked to unleash at the first opportunity. Somewhat strangely, the pair had never faced each other before, and Osaka's lack of experience against top-class left-handers was one of the match-up's unknown factors. Osaka struggled to read Kvitova's serve initially but picked up the pace in the 12th game, forcing two set points. She could not take either, though, Kvitova producing a tremendously gutsy forehand to save the first and then a big serve on the second. Given Osaka had won her last 59 matches when taking the first set, the size of Kvitova's task was clear, but the 28-year-old responded well and secured the first break of the match on her seventh chance. But Karolina Pliskova's win over Serena Williams from 1-5 and match points down showed that a tennis match is never over until the final ball is hit, and this time it was her fellow Czech mounting the unlikely comeback. Stepping up to serve for the match for a second time, Osaka's demons were nowhere to be seen and she clinched her fifth match point to ascend to the throne as the new queen of tennis.